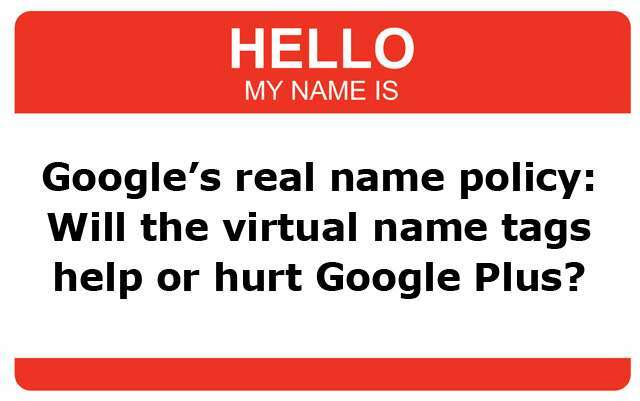 Home Business The Google Plus Real Name Policy – Good or Bad for the Bottom Line? If you’re using Google Plus, you’ve probably heard about the controversy over Google’s “real name policy.” In the interest of transparency I’ll tell you that I have some very big problems with this policy, Google’s flip-flopping about what “real names” mean, and Eric Schmidt’s recent foot-in-mouth comments on the matter. And yes, I do use my real name on the network. But I don’t want to talk (yet again) about why the real name policy is a terrible idea or why others think it’s great and going to lend some sort of greater credibility to the network. Instead I want to talk about the business of it all. Let’s face it. We all know Google is in the information business. They gather it. They find ways to monetize it. We, and the information Google can gather about us, are in essence the products they sell to advertisers. The more they know about their users, the more targeted ads can be, and the more valuable your eyes on an ad become. Cha-ching! In this sense the real name policy is smart business for Google. The more information they can provide about their users, the more they can rake in from advertisers and the more they can tailor other services to your habits and interests to keep you on their site. On the other side, the real name policy could do some serious damage to Google’s best attempt in the social media game yet. I loved the concept of Google Plus from the start. They got some things right on the privacy front (Circles being a great example). We had control over everything we shared. But then they took control of our identities. In the end, it’s tough to have things both ways. Google is already alienating some of their early users, myself included. It isn’t just that there are good reasons to use names other than our “real” ones. It’s the way Google still seems oblivious about how the social Web works. Platforms are created for the users — not the other way around. If Google yet again shows people they aren’t prepared to give users what they want in a social platform, they’re going to devalue their own “product” early in the game. We won’t share all of the information they (and their advertisers) want or need. We won’t trade our time on one social media tool for Google Plus. And if they push G+ users hard enough, they risk pushing them away from other Google products as well. After all, if you tell users they aren’t welcome to be who they are in this social context, why would they want to waste time with you in any other sense? They’ll move on. There are other search engines, other feed readers, other email providers (or means of checking Gmail accounts), and there are certainly other social networking platforms. If Google does anything with this policy of exclusion, it might be to remind their users that all of these other options exist. That’s a risk they took when they chose to tie our beloved Google tools to this new identity service. Personally, I hope the folks at Google get a clue before it’s too late (or at least change their tone on the subject). I’m a big fan of the platform itself, and I find some of the best conversations in my network happen within Google Plus. Yet I’ve seen those conversations become shallower and more promotional in nature as colleagues and friends leave or cut back on information and opinions they’re willing to share. That’s even true of those already using their real names. That’s just what I’m seeing in my own Google Plus network. Have you noticed any changes in yours recently? Whether you’re for or against the real name policy, how do you see it helping or hurting Google’s position in social media? Are they doing what’s best for their advertisers and their own business, or do you think they might be doing more harm than good? Share your thoughts in the comments below.